Removing the smoke unit from the 2-8-0 is really not that difficult. You do have to work slowly and carefully, and be careful what you grab or press on, because of the many small detail parts. 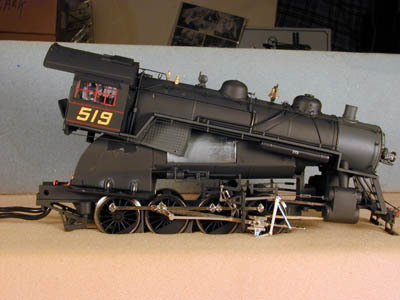 Lay the locomotive and tender carefully on its side. I use a block of foam. To turn it over, I lift the loco by a dome and the bottom of a driver. First step is to remove the pilot truck. 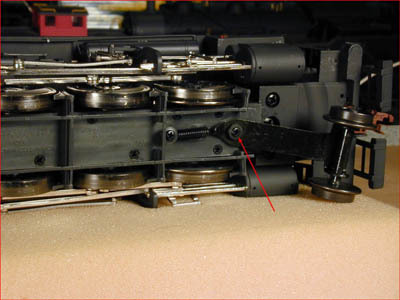 Remove the one screw and washer, and unhook the assembly from the spring. Leave the spring on the loco. 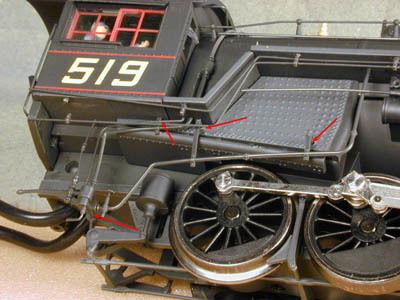 Next remove the screw, washer and spacer from the loco, and the two small screws which hold the tender shell. 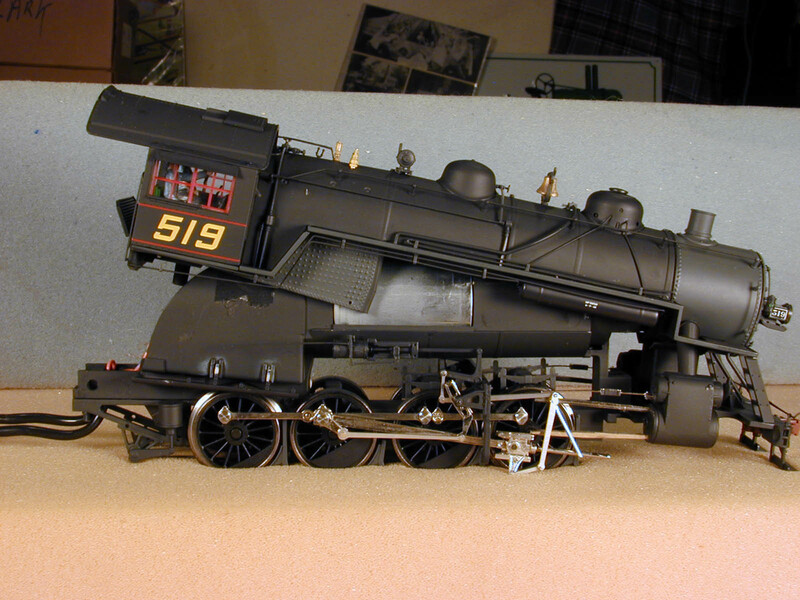 Turn the loco/tender upright on the table. Unscrew the smokestack insert. The tender shell lifts straight off. Unplug the long connector with wires leading to the loco. I like to pry a little at the gap between the plug and socket, to avoid pulling in the wires. Mine came out easily. 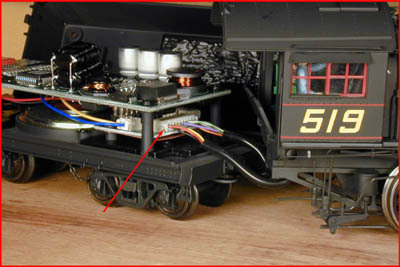 Here is the tender disconnected from the loco. Set it aside. One piece of detail needs to be removed from each side. 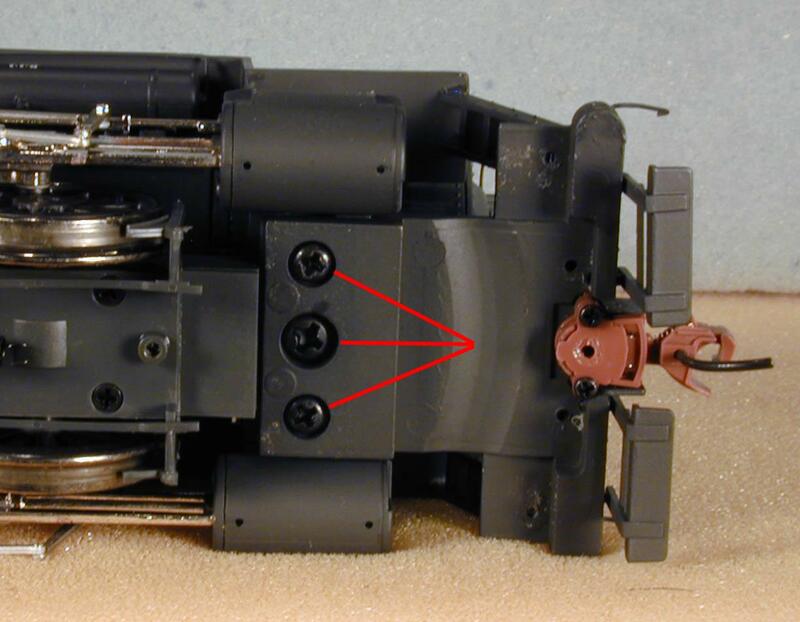 There are 4 attachment points, shown by the arrows. There is no glue, they just plug into holes. Gently pry them out with an exacto or a very small screwdriver. Here is the piece itself. 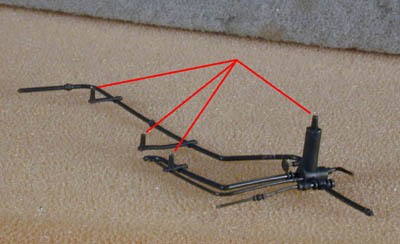 The lines point to the attachment points. Be sure to remove the one from the other side too! I usually use a foam cradle while I remove these 3 screws. With these screws removed the cylinder and pilot deck assemblies will be loose, but will be held to the boiler by piping. That's fine, we need them loose, but don't want to remove them. 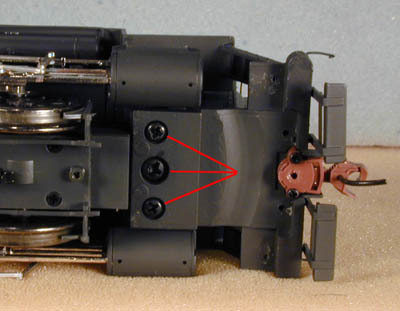 Note: Carl Tuveson adds a step to remove the screws holding the piston guides. They are behind the guides, one screw for each guide. 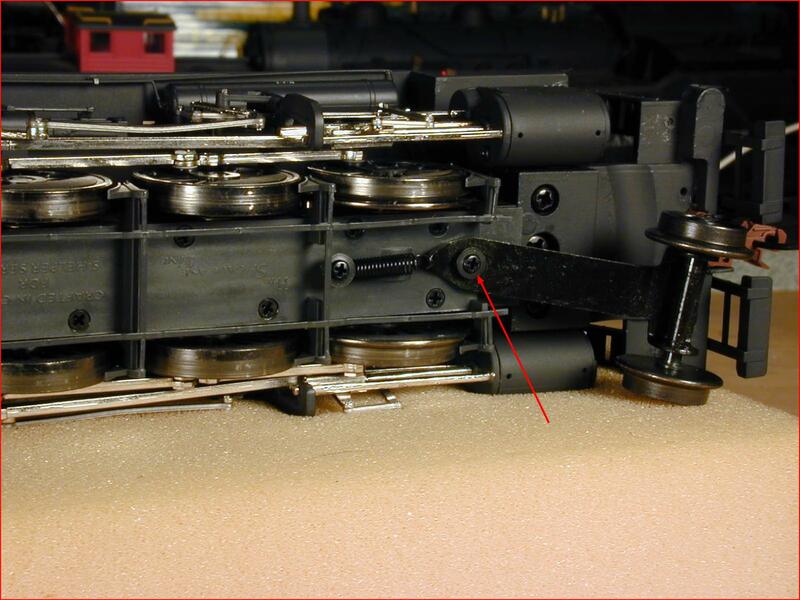 This will allow the guides to move without breaking when pulling the shell off of the chassis. The guides are VERY fragile! 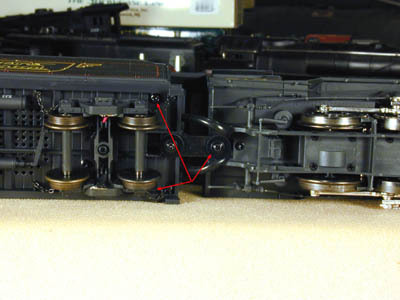 At the rear of the loco, remove the 2 screws shown. Now start lifting the rear of the locomotive off the chassis. You can use a small screwdriver to pry between the chassis and the back of the cab if you want, but mine didn't need that much force. Br careful to grab a solid part of the frame, and not the plastic details! Lift straight up at the rear, pivoting on the front, until the chassis will clear the bottom of the cab. Once the cab clears the chassis, start sliding the boiler forward as you raise the rear. It will slide out nicely! No valve gear has been disconnected, the rods going to the cylinders all just slide out. 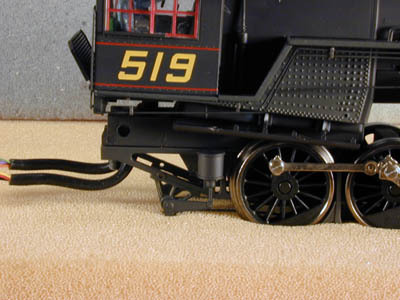 Once the boiler is removed, be careful handling and setting it down so as not to damage the valve gear. 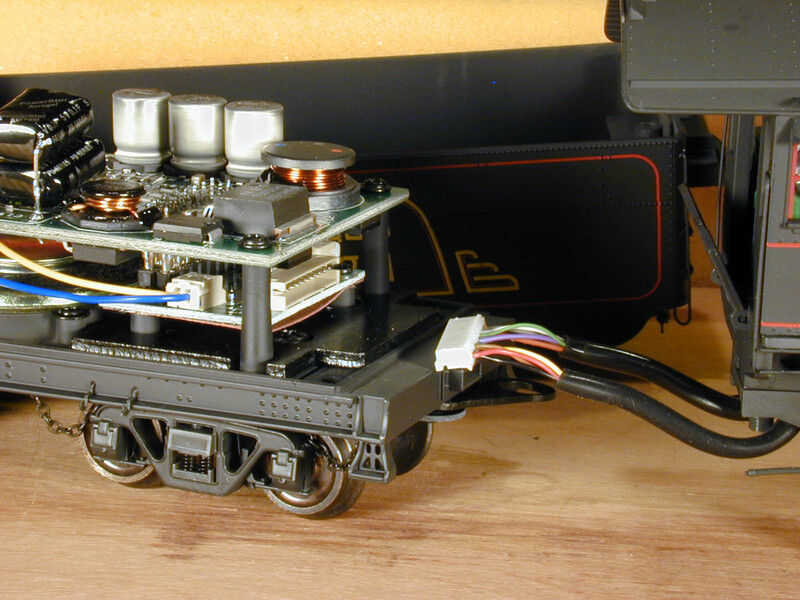 Here is the Chassis with the boiler behind it. 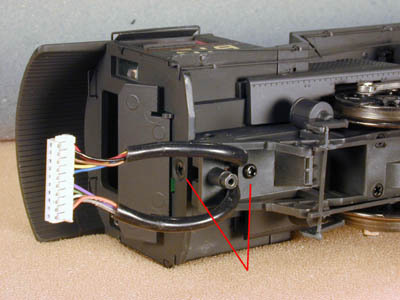 The smoke unit will now just lift out, and is connected with a plug. All contents copyright © 2004-2013 by William Clark, All rights reserved.